A medieval missionary finds the point where sky and earth touch, 1888. 'Un missionnaire du moyen age raconte qu'il avait trouve le point ou le ciel et la Terre se touchent', (A medieval missionary recounts that he has found the spot where the sky and the earth touch). lllustrated plate from 'L'atmosphere: meteorologie populaire' (Paris, 1888) by Camille Flammarion (1842-1945), a French astronomer and popular science writer. 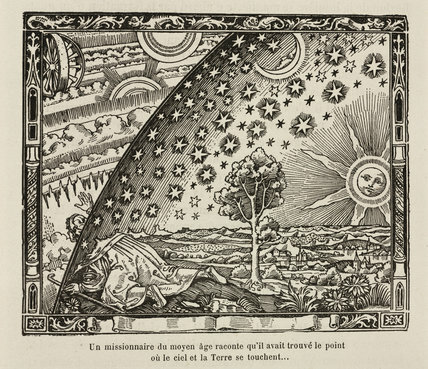 This woodcut is unlikely to be mediaeval in origin, but was used by Flammarion to illustrate the notion that mediaeval man believed the earth was flat. The missionary is shown at the point at which the earth and sky join, and he has discovered a hole where, by stooping, he can pass 'under the roof of the heavens'.